I am embarrassed to share this story, but I hope it will keep others from making the sort of egregious mistake I did. I have been canyoneering for roughly four years without incident. I know many people with more intricate technical knowledge than I have, but overall I am recognized as a knowledgable and reliable person to have on a team. I have made multitudes of good decisions that have ensured the safety of others and my own. Yet, none of that matters if one critical error is made. 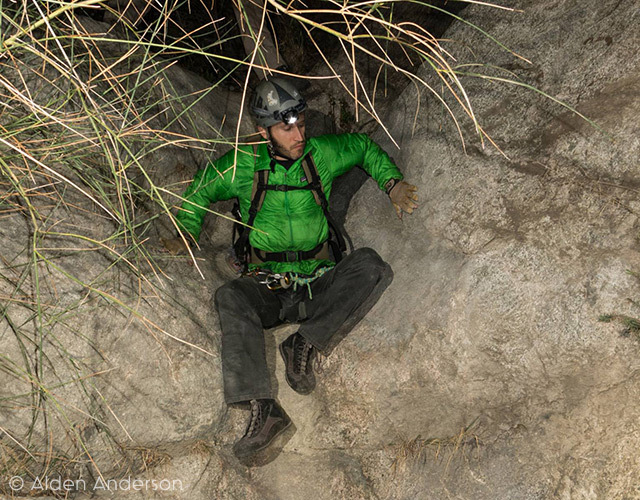 Canyoneering is not a dangerous sport, per se, but it can have drastic consequences. Last night, nine of us ran a short canyon in Big Tujunga with three rappels and minimal hiking. A cakewalk. As seems to often be the case, this is when mistakes are made, when things are so simple we let our brains shift into auto-pilot. The first rappel was roughly 50 feet down a sloping, slightly curving face. A baby rap. Hardly worth a second glance. I didn’t consciously think those things, but deep in my subconscious I had made that assessment and deactivated crucial brain mechanics. I was last man down. Before clipping in, I noticed what appeared to be a slack loop crossing through the carabiner and across the gate on the pull side of the rope. It looked to me like there was a potential for the pull line to pinch the carabiner against the rock and introduce a pull issue. I pulled the free end of the rope through the carabiner to remove this “extraneous” loop, tied a pull cord to the end, clipped the rope bag to my harness, and clipped my descender onto the rappel side. I leaned back to begin my descent. There was enough time for my brain to process what was about to occur, to think “so, this is going to happen, is it?”, but no time to react. Airborne. In my right hand, a non-tensioned rope swung free. The world in front of my eyes a blur. The curvature of the face and my backpack met. Next, my right arm kissed the face. The surface area of my body and backpack produced friction as it brushed down the sloping wall turning my immediate fall into a decelerating semi-vertical slide. Oddly, I was calm, my thoughts seeking a solution to stop my slide. I extended my arms, my body turned slightly and for a moment I halted. A tiny moment, long enough to think, “I stopped.” But. I was off again. Scraping down the rock, fighting to keep my body from rotating sideways. Unable to visually identify anything around me. Then I slowed to a halt. I was at the bottom, on a ledge above a five foot downclimb, the rope still attached to my descender. I had slid down onto my feet and I stood. I was befuddled. Members of the group called to me, asking if I was okay. I was. My left ankle was a little tight, my right knee was scraped and bleeding, my right elbow bruised, and the right arm of my jacket torn. But, that was all. I couldn’t believe my luck. Had I began the rappel further left, had I twisted backwards in space differently, had any number of tiny variables varied, the outcome could have been quite different. I pulled the rope. It fell, followed by a loose carabiner. I ran the rest of the canyon and here I sit typing the next day with no discomfort. I made a fatal error. Dumb luck saved me. I can’t expect to be so lucky a second time. None of us can expect to be so lucky a single time. It took me some time to piece together what had happened. What had looked like a loose extraneous loop running through the carabiner was likely a loosened vital twist in the clove hitch holding the ‘biner block together. I should have inspected the knot after pulling the rope through. Better yet, I should have re-rigged the rope as soon I saw a potential pull issue. I should have tested the rope before weighting it. These are stupid, moronic mistakes. I know better. A beginner knows better. Hell, people who have never heard of canyoneering probably know better. I have never let another person rap down a line I’ve rigged that I haven’t inspected multiple times. Why was I so irresponsible with my own life? I assume it must have been complacency. We all suffer from this to some degree. We grow so accustomed to certain activities we stop thinking about them, we cruise through on auto-pilot. Sometimes this is fine, we don’t need to think about everything we do. This does not apply to canyoneering or any activity that can have substantial consequences. Learn from my mistake. Don’t let your brain slip into auto-pilot, treat every drop with respect, check everything you or someone else does multiple times. We all know this, but apparently I forgot. Don’t be like me. I owe everyone in that canyon an apology. Our safety in a canyon doesn’t just affect us. It affects everyone in the group. My stupidity could have turned this into a rescue situation (or a body recovery). The group would have then become responsible for my evacuation. Because I didn’t take a few seconds to check a simple setup. If everyone in last night’s group said to me, “I still like you, but I don’t feel comfortable running canyons with you anymore,” I would understand. The decisions we make in a canyon affect everyone in the group. There is no room for selfish actions or complacency. Thank God, you & your group are ok! My prayers were answered. Love you,son!